Garmin stopped making rudimentary "GPS" units years ago—their high-end models are more like portable computers that track everything from your current whereabouts (it is GPS-enabled, after all) to you current altitude, heart rate, calories burned, miles covered, total feet climbed….you get the idea. Today, however, the company is unveiling two even more advanced models. 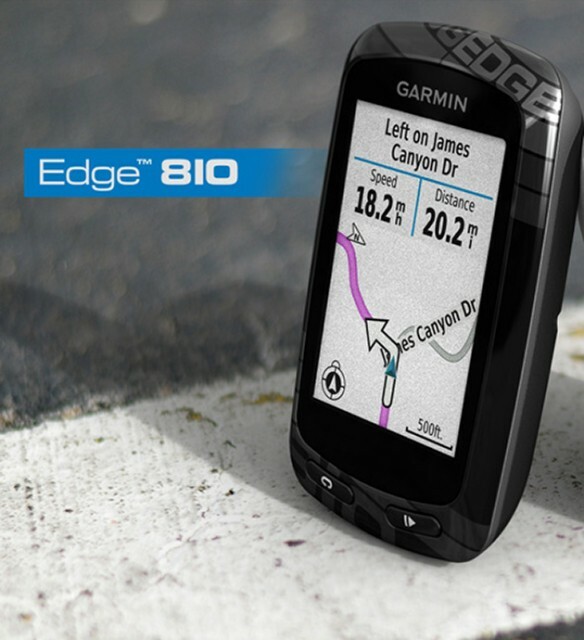 The Edge 810 and 510 are Garmin's first dedicated cycling devices with real-time connectivity. The new models combine the most popular aspects of their current Edge 800/500 models while adding advanced connected features through a smartphone. In addition to a new user-friendly interface, the 810 and 510 sport live tracking, social media sharing and real-time weather updates. The original Edge 800 turned heads when it debuted its forward-thinking touchscreen interface. The new, $500 Edge 810 features a sleek 2.6-inch color display, up to 17-hours of battery life, and a newly redesigned and simplified touchscreen interface. The 810 is compatible with optional detailed street or TOPO maps including BirdsEye Satellite Imagery, so it can guide cyclists for touring, commuting or extended activities where they might need onboard maps and navigation. Because it's GPS-enabled and its navigation capabilities require no data usage, the Edge 810 will work anywhere in the world. The $330 Edge 510 was designed specifically for performance driven cyclists and is a light-weight (80 gram) compact option. The 510 features a similar user interface to the 810, boasts a new 2.2-inch, sunlight-readable touchscreen display and is compatible with both GPS and GLONASS satellites for faster satellite acquisition and improved signal lock. According to Garmin, the 510 is suited for the most challenging conditions, such as canyons and adventures with heavy tree cover. The Edge 510 is said to be rugged, waterproof and has up to a 20-hour battery life. Both the Edge 810 and 510 accurately track speed, distance, time, GPS position, elevation, calories burned, ascent and descent. For even more real-time data on display, the 810 and 510 sync wirelessly through ANT+™ technology with compatible third-party power meters as well as Garmin heart rate monitors and speed/cadence sensors. For extra-precise ascent and descent data, they incorporate a barometric altimeter to pinpoint changes in elevation. The new activity profiles feature allows cyclists to customize data fields and device settings based on their cycling activity, such as training, racing, or road and mountain biking. Switch profiles with a simple swipe of the touchscreen and the device will be set up to show the data riders need for that ride. When a ride is complete, the 810 and 510 display any new personal records achieved, such as farthest distance, most ascent gained and more. 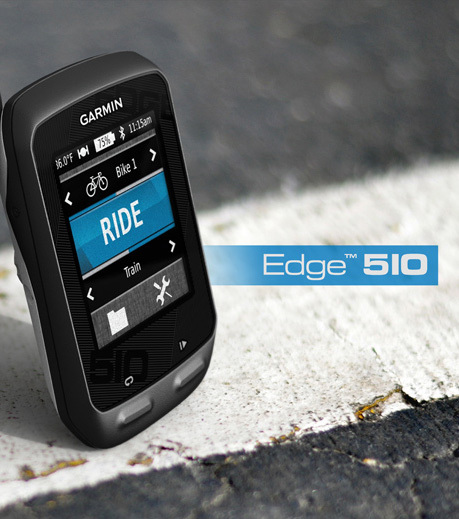 The Edge 810 and 510 offer a suite of connected features when paired with a cyclist's smartphone (Apple® or Android™) and the Garmin Connect Mobile app. This allows riders to gain comprehensive, accurate ride data from a dedicated device, while keeping their phone out of the elements and saving its battery in case of an emergency. The Edge tracks the data and sends it to the phone using a Bluetooth connection. This connection allows cyclists to share all the details of their rides with friends, family and social media contacts. Cyclists can post an update immediately after their ride or race with details from their completed activity. Riders can create posts via their smartphone, and the robust ride data's already there, thanks to the interface with Garmin Connect Mobile. The LiveTrack feature allows cyclists' friends and family to follow their races and training rides in real-time. Invite followers using email or social media, so they can view live data on a Garmin Connect tracking page on a smartphone, desktop or tablet. Once they receive an email invite, they can click to follow and see cyclists' stats like speed and distance, heart rate (optional), cadence and power (optional), and location on the map. This is a big plus for any rider going out on a solo ride. Get real-time weather conditions, forecasts and alerts (in areas with coverage) directly on the Edge 810 and 510 when they're paired with a smartphone and the Garmin Connect Mobile app. This feature is useful for extended rides, and it lets cyclists keep their smartphone safe and dry, while the weather data they need is at their fingertips. Garmin has, undoubtedly, felt stiff competition for riders' attention from the likes of Strava. The company is aiming at recovering that lost ground with its new Garmin Connect Mobile app which allows you to instantly store, share and analyze every detail of your ride— all from the road. The Garmin Connect Mobile app allows for wireless uploads of completed activities from the Edge 810/510 as soon as cyclists finish recording an activity. Riders choose whether activities are automatically or manually uploaded. Once a ride has posted to Garmin Connect, their own "connections" can view them within one of the world's largest online fitness communities. 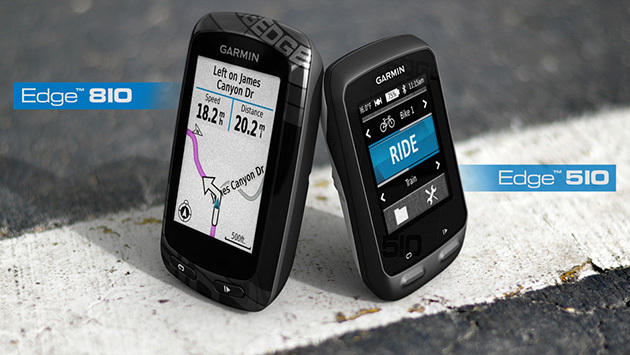 Riders can also search their courses and workouts stored at Garmin Connect, download to their smartphone, then send directly to their Edge device — wirelessly. Cyclists can then navigate to the start of the course and use the Virtual Partner® feature on the Edge to follow and even race those previous rides in real-time. The Edge 810 is available now and has suggested retail price of $499.99 and the Edge 510 will be available sometime in the next few months for $329.99. Mounting options include a new out-front mount for heads-up positioning and a standard quarter-turn mount. The Garmin Connect Mobile app will be available January 10, 2013. For more info, go to www.garmin.com/edge.